Meditation is also a wonderful tool in helping us find balance and restoring calm. It is quiet time for you to spend away from the hustle and bustle of daily life and whether you spend 5 minutes a day or 60 minutes a day it is beneficial for you physically, mentally and spiritually. Being mindful of what you are doing in any moment can also be a meditative practice. For example, during your morning shower routine take time to really be mindful rather than thinking of all the things ahead of you that day. Feel the water, the soap, the shampoo, visualise negativity draining away. Walking can also become a meditation in itself as well as you focus on connecting with the Earth as you walk. If these concepts interest you then why not sign up for the meditation classes which are run regularly. See details on our meditation group page or contact Debi for more information. 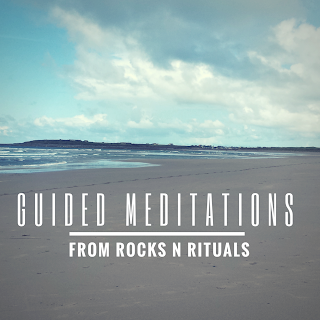 Would you like to preview a guided meditation recorded by Debi? Click here to download a sample preview. If you liked this preview and would like to purchase the entire recording which is almost 20 minutes in length together with 4 more guided meditations please click on the Buy Now button below to purchase the CD. There are 5 guided meditations in total on the CD that Debi has made and the total running time is almost 80 minutes. If you would prefer to download the tracks instead this can also be arranged - you can confirm this when you place your order by specifying you would like a download instead. The cost for all 5 meditations is only £7.50. Please note you do not need to have a PayPal account in order to use this service as you can continue as a guest and pay with any major credit or debit card. Crystals can help with meditation. If you are feeling "flighty" like your head is in the clouds and your mind is racing you may need to ground yourself and re-connect with the Earth. Here is a sample meditation for you to try. Familiarise yourself with it and then give it a go! Hold a piece of smoky quartz or obsidian in your hand, these are excellent grounding crystals. Sit comfortably with your back straight, turn off all distractions such as TVs and mobiles then close your eyes. Take several deep breaths to calm yourself and then try to clear your mind. This is easier said than done but counting back from 25 to 1 slowly with each breath can help you focus. Imagine there are roots coming from the centre of your body down through your legs into your feet. Imagine these roots are going deep down into the Earth where they are anchoring themselves on the crystal you are holding in your hand. The crystal is at the centre of the Earth. You are anchored. You are safe and protected and nothing can harm you. If you wish you may like to visualize healing white light coming down from above and passing through your head, down your neck and into your arms. It passes through your body and heart down into your abdomen. Down through your legs and feet and into the Earth. Sit quietly in this meditative state for as long as you feel comfortable. If this is your first time you may find you can only hold the visualization for a few minutes but with practice you will be able to do it for longer. When you are ready slowly open your eyes and come back into the real world. Spend a few moments wiggling your toes and fingers and then perhaps go and have something to eat or drink.